I have suspected from day one (literally), that GM plans to offer the Caprice within a couple of model years after its police-trim launch. This would allow GM to continue to have a RWD, non-luxury sedan, and give Holden a major shot in the arm with production until the Alpha platform is ready. And, with that, I’ll show you the first appearance of the Chevy Caprice PPV… “detective unit” trim. 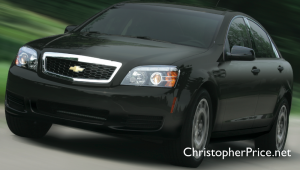 This was originally meant to be an “undercover” trim, until GM realized that anyone looking for undercover cops need only look for the one car on the road that civilians cannot buy… the new Caprice. Realizing that mistake, GM now markets it as a car for detectives, instead of billing it for undercover use (used G8s work great for undercover work in that case). If only they’d market it as what it should be; a long-wheelbase Pontiac G8. Hey, Holden sure does over in Australia. Holden Commodore Sportwagon SS V Series Special Edition… if only American GM would match Australian GM. GM needs to introduce this platform as the “real” Buick GranSport rather than the anemic 4 cylinder version they are introducing. That vehicle as a GS is a joke – a really bad joke.